French consumed 16 pizzas for 1 hamburger! With more than 3 billion pizzas sold, this market is the second in the world and one of the most dynamic. More and more consumers turn to new modes of consumption allying speed, freedom and user-conviviality. The pizza, for its excellent value for money, gains the votes of the European consumers for its undeniable assets: warm and well-balanced dish, absence of preparation and dishes, saving of time and immediate consumption. More and more, the consumer wishes to have access at any time, to fresh and traditional pizzas made by their favorite pizzaïolo. 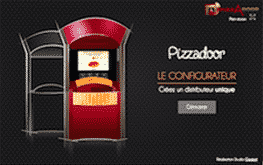 Practical, healthy, economic and fast, the pizzas vending machine joins in these new modes of consumption, allowing the pizzaïolo to increase their sales while improving appreciably their working conditions. Vending machine for pizzas appeared in 2002. The market was in this embryonic period and some pizzaïolo who purchased the first machines underwent of numerous breakdowns and technical problems, punishing an optimal operation. In this time, the technology did not allow restoring to the consumer a good quality of pizza and the image of the distributors remained negatively for a long time. It is with the first distributors made by ADIAL and delivered from 2003 that the reliability and the quality of pizzas progressed. The market, in maturation until 2009, saw to appear little by little new owners of vending machines who, satisfied with the design and with the quality of the distributors, began to gain successes of sale. Today, the market starts its growth with more and more important request of equipments on behalf of the professionals of the pizza, allowing them to increase their sale with ADIAL distributors, reliable, high quality made and emphasizing the work of the best pizzaïolo.